It was Isaac Asimov who coined the three laws of robotics in his 1950 classic ‘I, Robot’ – A robot may not injure a human being or, through inaction, allow a human being to come to harm; A robot must obey orders given it by human beings except where such orders would conflict with the First Law; A robot must protect its own existence as long as such protection does not conflict with the First or Second Law. Isaac Asimov, who was a prolific science writer, was a Professor of Biochemistry at Boston University and the world accepted these laws of robotics coming from a Biochemistry Professor! Today as we see the next industrial revolution looming over us – Industry 4.0 –the cyber physical revolution – we are definitely in need of some significant modifications to the laws. Today we have several deaths directly due to robots and no one can hold them directly accountable. Or are we to consider ways to really ensure the first law to be an ethical rule than an absolute one and if any robot breaks the first law then condemn it to death by short-circuiting? The world has already witnessed the first-ever citizen robot as Saudi Arabia has inducted the first robot to the citizenship. Sophia subsequently visited IIT Bombay too and wonder what was her passport looked like? How to apply Roman Dutch law in our own old Hulftsdorp to an emerging technology could be an interesting dialogue. The US has established the Center for Occupational Robotics to ensure that human workers are protected. This is the most recent addition to its Center for Disease Control. The stats reveal that around 61 people have so far succumbed to due to wrong encounters with the machine kind between 1992 and 2015. As the types of robots are getting increasingly diversified – industrial robots, collaborative and co-existing robots (cobots), humanoids, exoskeletons, surgical robots and autonomous vehicles, robots are increasingly find itself in the midst of us and thus the chances for misadventures are increasingly likely. A slap on the face from a robot can be quite painful if you happen to tread into their workspace. I am sure that we all can benefit from the output from this US Center of Studies. In recent US elections when Trump triumphed, he was on record having raised the issue of the impending robotic revolution, though in a negative way. His idea of bringing factories back to America was to generate jobs internally. However, the advent of robots is likely to take away jobs. Why cannot I today invest in one of the most popular home servant robots – Roomba – and get that to clean my floors rather than spraining my poor back or spending money on external labour for a few hours and to face growling faces too in the process? Cleaning is mundane but a necessity. We had biotechnology revolution when Robert Haldane said, ‘Why do you want to do it yourself when you can get a microorganism to do it for you?’ A similar situation is evolving rapidly and across a much broader front. Why do it yourself when you can get a robot to do it for you? The options are becoming quite amazing, so much so that one may have to plan one’s leisure and also figure out how to get paid while doing nothing. Governments may have a different scheme of Samurdhi that has to be developed to keep people on a living wage in the absence of an opportunity to work for pay. The World Economic Forum had predicted that robots would result in a loss of more than five million jobs in 15 developed countries by 2020. Developing countries too will not be spared. Sri Lanka is witnessing the robotic revolution too. For a long time university students engaged in robotic competitions and even in overseas competitions and it was quite common to witness teams from Sri Lanka emerging among prize winners. It is also no secret that in any science exhibition a robot would attract attention anytime. While it appears that there are capabilities, there was never an attempt to harness the talent. Most of these winners certainly improved their CVs sufficiently to ensure their acceptance to other economies and they become quite productive human capital outside Sri Lanka. It is no secret that there is a significant number of vacancies in the apparel sector not getting filled as there is no interest. It is also well-known that in the plantation sector, whether it is rubber, tea or coconut, or even in cinnamon peeling, the younger generation will not follow in their fathers’ footsteps. They appear to prefer the more sedentary professions, which actually may not have a significant impact on the economy. One may wonder whether we are actually wasting young lives away when watching this state of affairs. However, it should also be remembered that in a free society, one’s choice has to be respected. It is the leadership that should take necessary steps proactively to drive the human capital to maximise benefits. Coercion is not an answer. In recognising this, COSTI through its high-technology initiative with the Ministry of Industry and Commerce, identified the need of robotics to be present to support the industry. Looking around the presence of talent in the country was obvious. What was missing was the supportive environment to develop platforms. It is indeed happy to note the emerging space for Sri Lankan robotics. Certainly some industries had pioneered the integration earlier but there had been much less knowledge and experience sharing. The way forward thus is having a Government intervention when anybody can have the option of becoming part of the revolution. 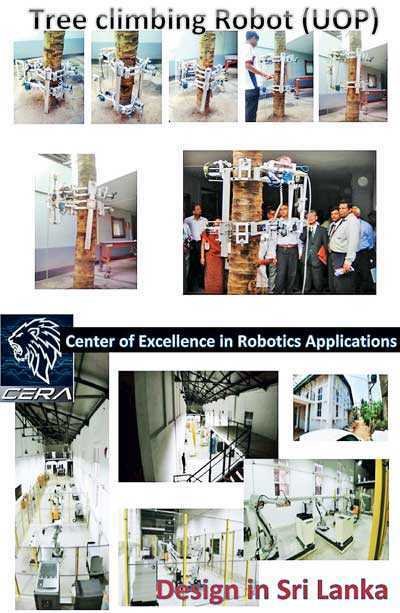 In a couple of months hopefully Sri Lanka will witness the emergence of CERA – Center of Excellence in Robotics Applications. Some targeted investments have happened in the last couple of years through the Annual Budget, which had enabled this situation to emerge. The journey had not been easy and still is not completed. It is interesting to note that old attitudes die-hard! Industry 4.0 may be what is beckoning us, yet our minds are perfect grounds for Industry 2.0 still. The pictures from CERA indicate the robots that have arrived and the stage is getting set for Sri Lankan robotic platforms to emerge. CERA understands that scaling up is always going to be a challenge in Sri Lanka though not impossible. In the light of such thinking the emphasis and the tag line for CERA is ‘Design in Sri Lanka’. One compares what our neighbour has identified – Make in India. When one considers the Apple iPhone, designed in California and produced in China, the exercise of grey matter properly applied can benefit far more than sweating profusely in producing many pieces. Anyway a combination of design and platform development will take place at CERA and the industry from medical to manufacturing is targeted immediately. The hard journey of CERA is for another column and this is just teasing the audience with some information. CERA will have access for juniors as well once the required space is provided. How much time one can save when vision is organisationally embedded and professionals are more tuned to contribute. CERA is going to be a testimony to many in many ways. CERA is quite a significant initiative, which should be capitalised on. It must be noted that advances in robotics is also assisted in turn by super advances in Artificial Intelligence. It is in year 2030 that the machine is set to beat the brain – the year of singularity. Interestingly this is also the year when the Sustainable Development era comes to its final year and if all goes well, nobody should be left behind and we should be in a world without poverty. In the same year then we will find ourselves playing second fiddle to a machine. Interesting indeed. The next 12 years are certainly going to be interesting. Hope that for Sri Lanka science and the march of intelligent robots would be of far more interest than petty low IQ politics. That interest is going to benefit the country more for sure. While some may worry and may even contemplate becoming modern-day luddites, we must recognise that it is our human ingenuity that has enabled us to come this far. The challenge in front of us, due to our own creativity, has to be managed again by being creative. There is no other way. With robotics too there is no turning back. We have always – and I know that I am not being quite unfair here – in Sri Lanka found ways to map out leisure within work and for us robotics should be a welcome entry. The concept of national productivity will have a whole new meaning to it!